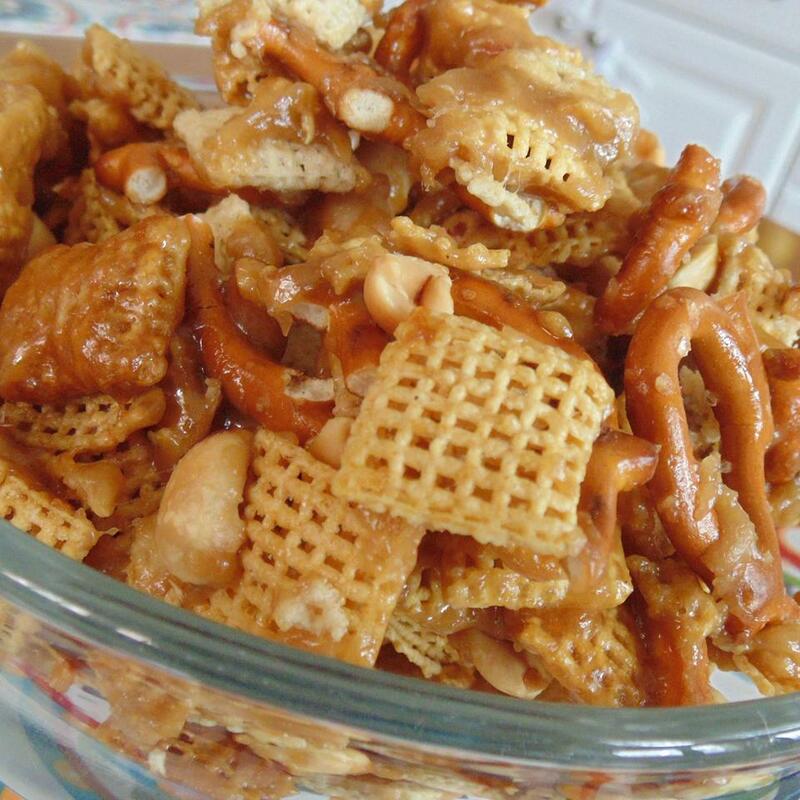 This sweet, salty, caramel snack mix recipe was given to me several years ago by a coworker. 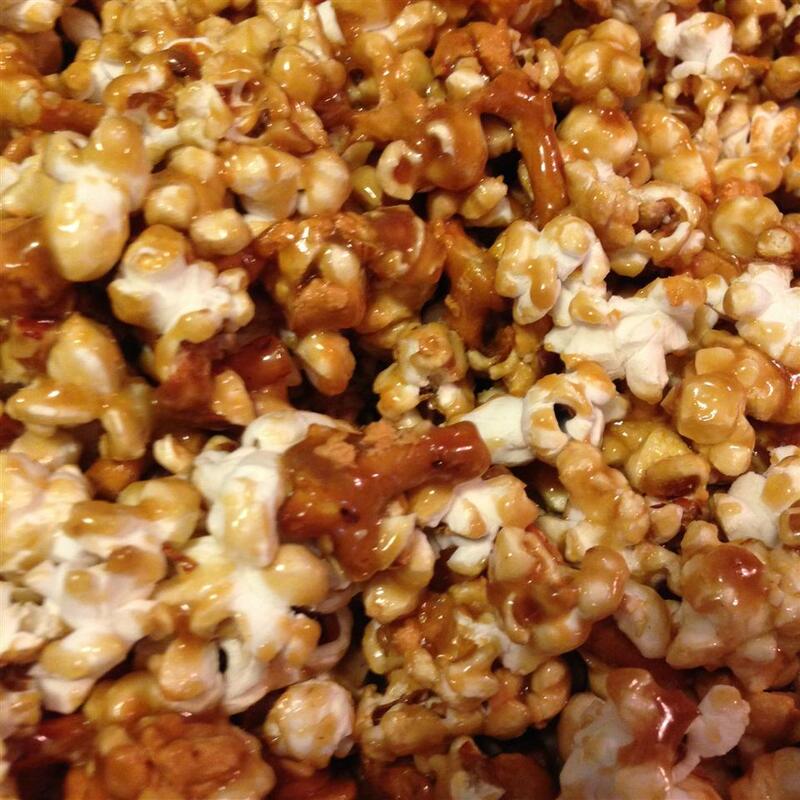 I make it for parties, game nights, and, of course, Game Days. 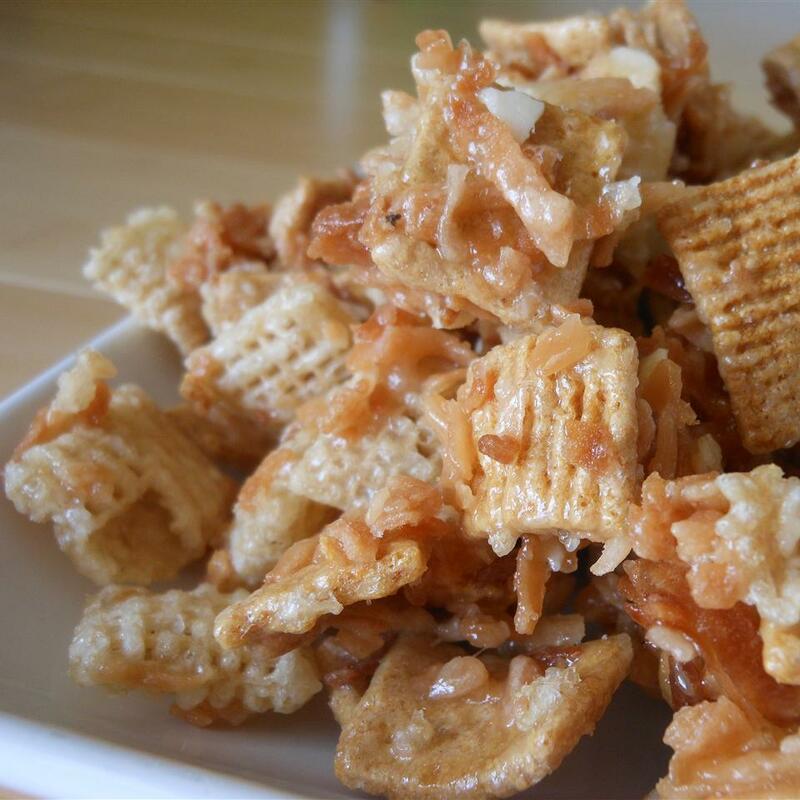 Mix brown sugar, butter, and corn syrup together in a large microwave-safe bowl. Microwave on high until bubbling, 3 1/2 minutes. Stir and microwave for 2 more minutes. Stir baking soda and vanilla extract into brown sugar mixture. 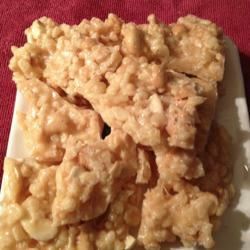 Fold cereal squares, pretzel sticks, and peanuts into brown sugar mixture until well coated. Microwave for 2 minutes. Stir and microwave again for 1 minute; stir well. Spread mixture onto waxed paper and cool completely; break into small pieces. 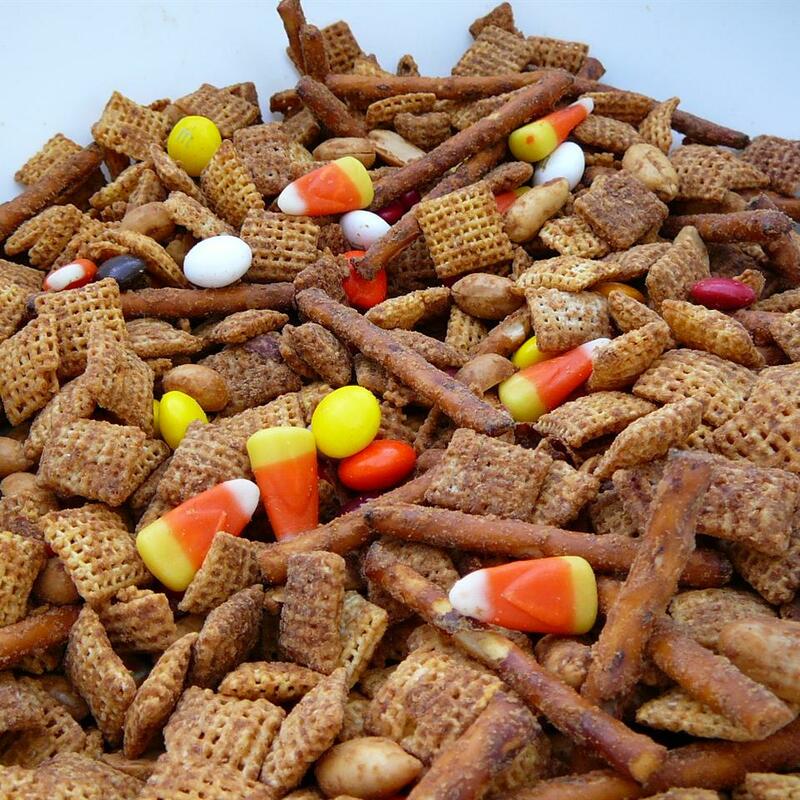 This is my new favorite Chex Mix! 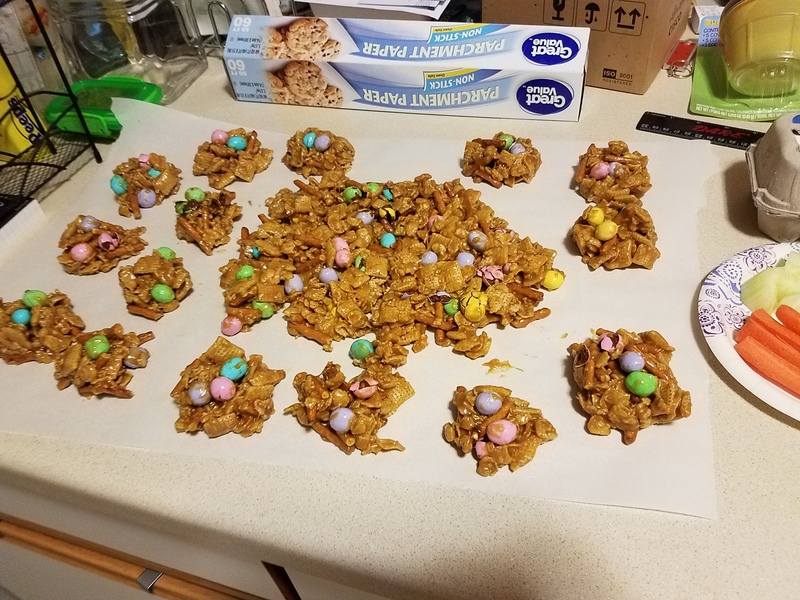 I doubled the wet ingredients and did 1.5 times the dry and it was the perfect coating. 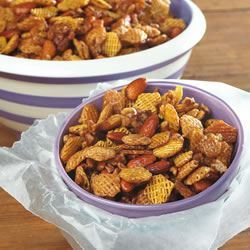 I personally prefer using half wheat Chex and half rice or corn as I think it gives some variety in the crunch factor. This will definitely be a staple in our house for parties and get-togethers. 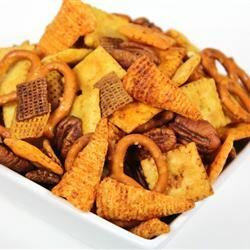 I was looking for a recipe to use the leftovers from the Original Chex Mix and this fit the bill. I used a 4-cup measure for the butter brown sugar and corn syrup mixture and was glad I did as the mixture rises while cooking. This was cooked in an 1100-watt microwave for a total of five minutes stopping once at 3 minutes to stir. 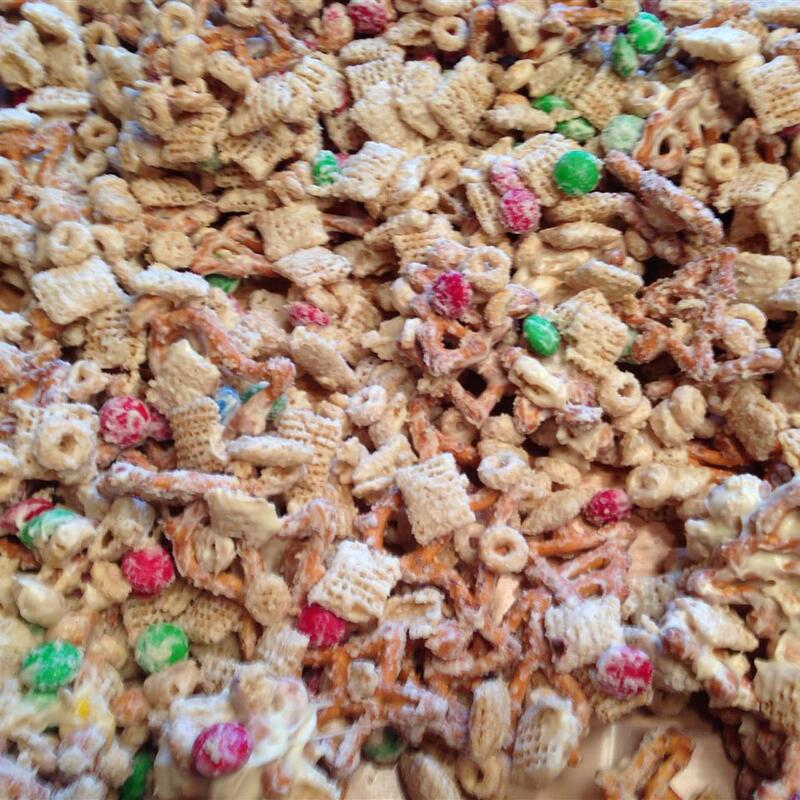 This was then poured over the Chex/pretzel/nut mixture and stirred to coat. The mixture did not coat well. If I make this again I&apos;ll cook it for less time yet-possibly 4 or 4.5 minutes-to allow the mixtue to be thin enough to coat well. 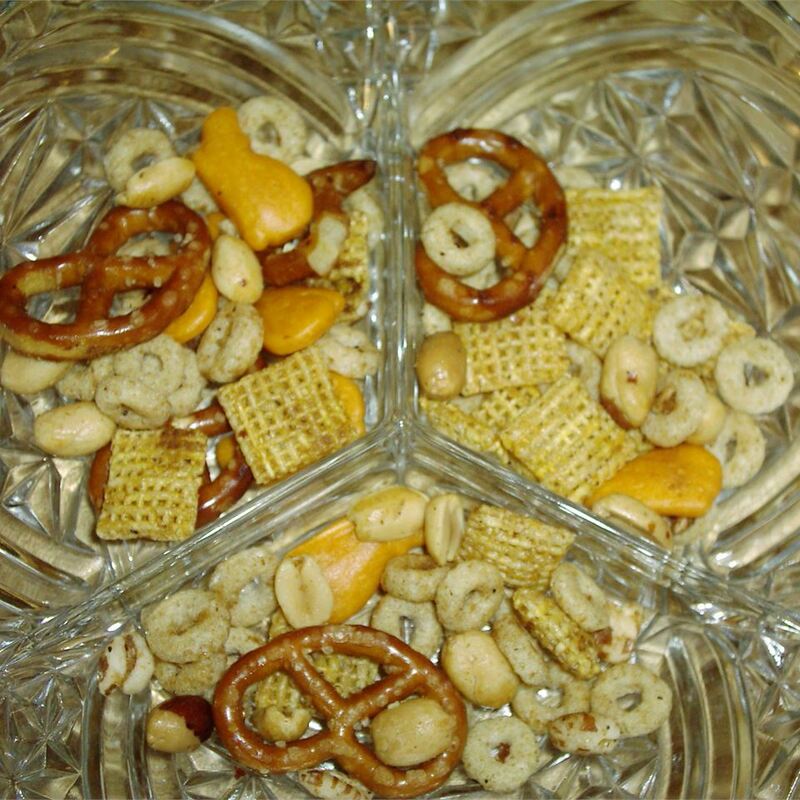 I would also reduce the pretzels to one cup as I felt the pretzel taste dominated the mixture. 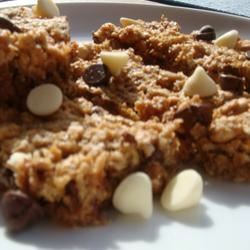 This is a quick snack if you have the ingredients and need something fast. 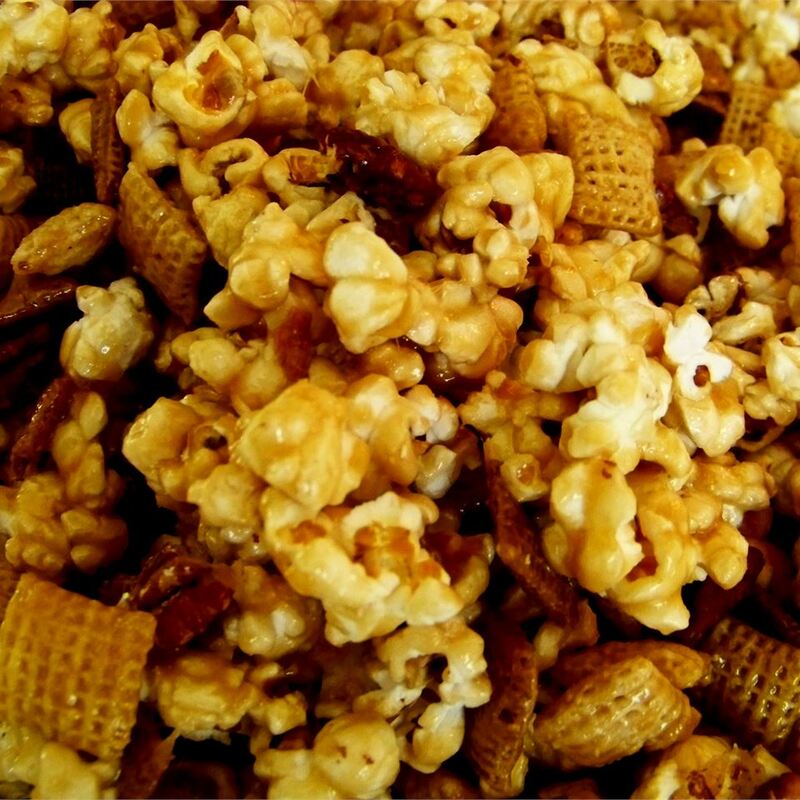 It is a typical sweet/salty mixture good but not great. 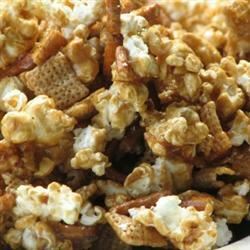 I used Rice and Corn cereal mix and added sesame sticks. I doubled the sauce ingredients per previous reviews. I also added 4 cups of Cgex cereal and 2 cups of a different for a variety. 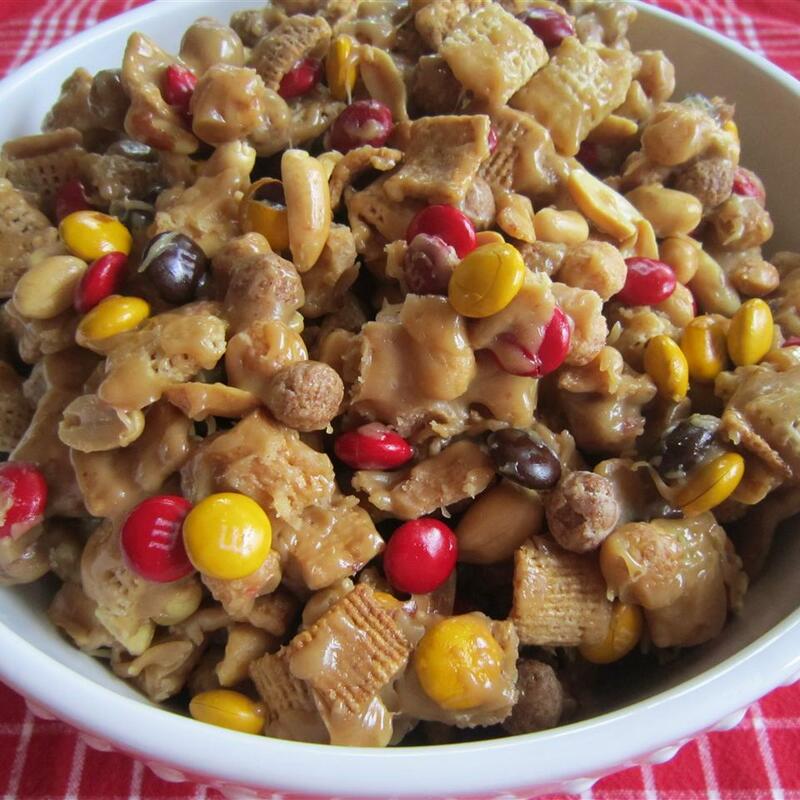 I was out if nuts so I added in Peanut M&Ms. This recipe is definitely a keeper! Very addictive. i like it i didn&apos;t make it more mixture at first then put a little bit more corn syrup over the top with 1 min left in the final stage and added another minute then stirring while warm. 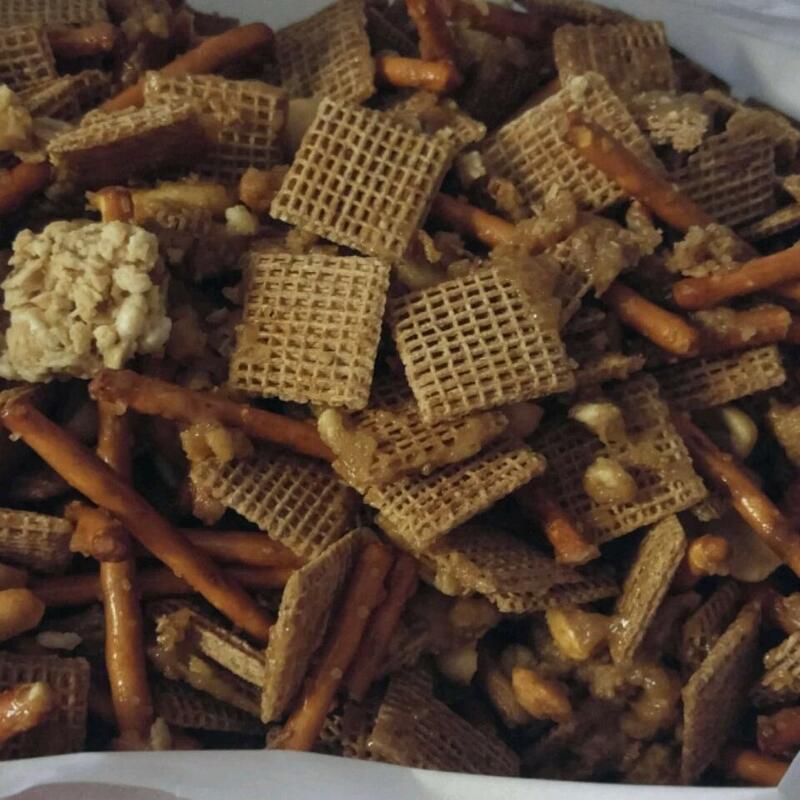 used chex with granola. delicious will make again and make more coating.